I’m a chocolate fan. A huge chocolate fan. But I’m a picky chocolate fan. I won’t bother with any of that milk or white chocolate nonsense. Just give me the good stuff. Dark chocolate all the way! It’s wonderful. And it’s even good for you. Dark chocolate is made up of cocoa beans, which are full of flavonoids that act as antioxidants. This power-packed little taste treat can lower your blood pressure, lower your cholesterol and increase your brain-power. The list of health benefits goes on and on. Besides the fact that it actually tastes really yummy. I’ve been making brownies for years, searching for the ultimate dark chocolate fix. With more failures than I’d like to admit, this time around success was a delightful surprise. Maybe it’s the stout, maybe it’s the salt. Whatever it is, the ingredients combine for a perfectly moist, perfectly sweet, rich chocolate treat. 1 cup of dark stout. We used oatmeal stout, which was really delicious. 16 ounces semisweet or bittersweet chocolate, chopped, divided. We used a combo of Bakers and Ghirardelli. Your choice of fancy salt for sprinkling. Our favorite is white flake sea salt. Preheat oven to 350°. Line a 9x9x2″ metal baking pan with foil, leaving a 2″ overhang. Bring stout to a boil in a medium sauce- pan; cook until reduced to 1/2 cup, about 12 minutes. Let cool. Reserve 1/4 cup stout. Stir 12 oz. chocolate and 1 cup butter in a medium metal bowl set over a saucepan of simmering water until melted and smooth. Whisk sugar, eggs, and vanilla in a large bowl to blend. Gradually whisk in chocolate mixture, then 1/4 cup stout from pan. Fold in flour and 1 1/4 tsp. salt. Pour batter into prepared pan. Bake brownies until surface begins to crack and a tester inserted into center comes out with a few moist crumbs attached, 35–40 minutes. Transfer pan to a wire rack and let cool for at least 20 minutes. Stir remaining 4 oz. chocolate in a medium metal bowl set over a sauce-pan of simmering water until melted and smooth. Add reserved 1/4 cup reduced stout, remaining 2 Tbsp. butter, and 1/4 tsp. salt; whisk until well blended. Pour warm glaze over brownies. Let stand at room temperature until glaze is set, about 40 minutes. 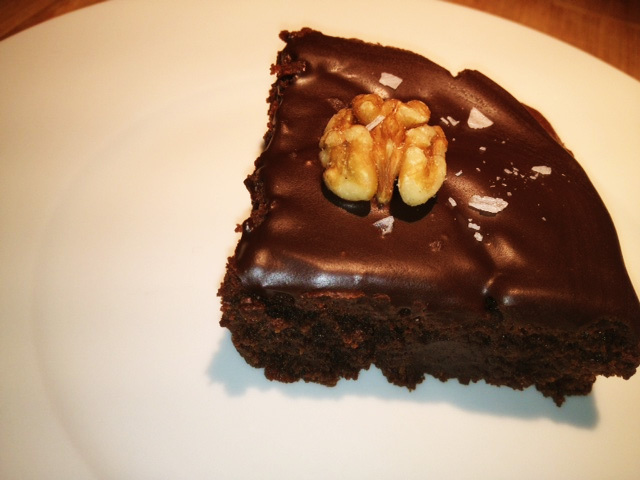 Using foil overhang, lift brownie from pan; cut into squares. Place a walnut on each square, sprinkle with tiny bit of fancy salt. Next Post Raising kids the Italian way. Good, bad, indifferent? You be the judge.